Baseball was first introduced to Japan in the 1870’s. Two men are largely credited with its introduction in the country. The first was Horace Wilson, an American professor teaching in Tokyo, who brought the game to his Japanese students. The second gentleman was Hiroshi Hiraoka, a Japanese engineer, who returned from studying in the United States toward the end of the decade and quickly formed an organized team with some of his co-workers. It was within the Japanese universities that the game began to spread and become popular. By the turn of the Twentieth Century, the Big Six University League was dominating the game in Japan. A number of these schools also played teams formed by American ex-patriots in Japan and even traveled to the United States for competition. And, Japan began to see American university teams visiting to play their Japanese counterparts. By 1908, professional American all-star teams began traveling to Japan to play exhibition games and promote professional baseball. There were tours in 1908, 1913, 1920, 1922 and 1931, but the American teams always played Japanese amateur or college ballclubs. The games were quite lopsided. Even so, the game had a following. Matsutara Shoriki, who owned the Yomiuri Shinbun newspaper, decided to see just how popular and successful baseball could be with the Japanese population, by organizing the biggest exhibition with professional American players yet. In 1934, Connie Mack, the long-time manager of the Philadelphia Athletics, was asked to staff a team of some of the best players in Major League Baseball and bring them to Japan for an 18-game match-up against the Big-Six University League. 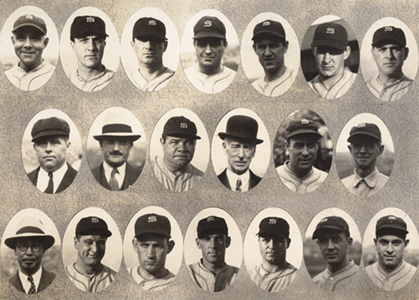 Mack compiled an amazing roster of some of the best baseball talent in America, while Shoriki did the same with the team comprised of Japanese talent from the “Big Six”. Besides the Babe, the Major League All-Stars team included: Eric McNair, Philadelphia Athletics; Charlie Gehringer, Detroit Tigers; Lou Gehrig, New York Yankees; Jimmie Foxx, Philadelphia Athletics; Earl Averill, Cleveland Indians; Bing Miller, Philadelphia Athletics; Moe Berg, Washington Nationals/Cleveland Indians; Frankie Hayes, Philadelphia Athletics (who replaced the injured Charlie Berry of the Philadelphia Athletics); Lefty Gomez, New York Yankees; Earl Whitehill, Washington Nationals; Clint Brown, Cleveland Indians; Joe Cascarella, Philadelphia Athletics; and, Harold “Rabbit” Warstler, Philadelphia Athletics. The welcome for the American ballplayers was impressive. In total, over 500,000 Japanese came out to greet the baseball stars when they first arrived and the biggest crowd-pleaser was the Babe. 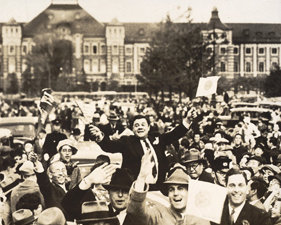 Babe Ruth rode through Tokyo waving American and Japanese flags to the enthusiastic fans, who yelled out “Beibu Rusu!” The games in Japan were staged at various stadiums including: Meiji-Jingu Stadium in Tokyo, Koshien Stadium in Kobe, Yagiyama Baseball Field in Sendai and others throughout the country. At the same time, the Americans pounded the Japanese, winning all eighteen games, against the team comprised of Japan’s best (eleven of whom would go on to be members of Japan’s Baseball Hall of Fame). Babe, for his part, hit 13 homeruns during the 18 game stint in Japan and electrified the Japanese crowd in the process. To listen to further details of this trip, please visit Julia Ruth Stevens’ interview in the Audio Interviews section. Go to Audio Interviews to hear interview clips of Julia Ruth Stevens including her trip around the world with Babe Ruth. Babe Ruth left Japan a legend. And, given that Japanese culture places very high importance on its legends, the Babe was forever immortalized within Japan after his trip. In fact, it is said that during World War II, Japanese soldiers would yell, “To hell with Babe Ruth!” during combat to insult their American enemies. In determining ways to end of the war with Japan, the Department of Defense had even considered sending Babe Ruth to Guam in order to deliver radio messages to the people of Japan to try to play to their baseball enthusiasm and convince them to end the war. While Japan’s fledgling professional baseball league had to suspend play in 1944 due to World War II, the occupying forces encouraged the league to resume play after the war was over as a way to boost morale. And, baseball began again in Japan in 1946 and has thrived ever since, clearly becoming one of Japan’s most popular sports. To this day, Babe Ruth is still a very popular sports figure in Japan and considered to have been an international ambassador for the game of baseball. For example, In 2002, a statue of Babe Ruth was built and placed in Yagiyama Zoological Park in Sendai City. While it may seem strange at first, the statue was erected at the exact point where Babe hit his first home run in Japan. That homer came on November 4th 1934 during Game 4 of the tournament at Miyagi Prefecture Yagiyama Baseball Stadium – ground that is now the zoological park. The statue was funded with donations from local citizens through the “Let’s Build a Babe Ruth Statue in Former Yagiyama Field” committee.